Dentists have a high incidence of occupational back pain and injury, in some cases making it impossible for them to continue to work as dentists. The nature of dental work means flexion of the lumbar spine and subsequent loading on the intervertebral discs and extra tension in the spinous ligaments, both of which contribute to discomfort and pain. 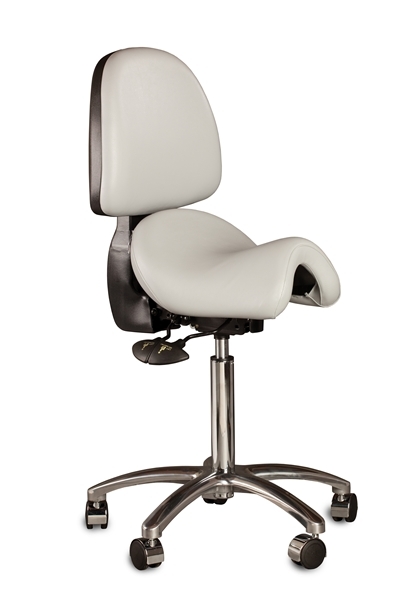 The Bambach Saddle Seat is designed to maintain a neutral pelvic position, the same as in standing. In this position the spine and shoulder girdle can function in their most natural and stable position. The position of least stress. In The Bambach Saddle Seat, the muscles of the back, abdomen and shoulder girdle are in natural balance. When leaning forward to work it is from the hips not the waist, which maintains the lumbar curve. Even when you have to hold this forward position for long periods for procedures necessitating holding your body still to perform close precise work, your spine is still in its natural curves. Seat tilts 5° backward and 10° forward for comfort. Heavy-duty chromed aluminum 5-star base. Generous 27" diameter for stability. 60mm chrome-hooded casters for smooth rolling on carpet or hard floors. It was my lucky day when I discovered you exhibiting your Bambach Saddle chair at the San Francisco Dental Meeting. I have suffered from neck and back pain for twenty years. The chair gave my body the opportunity to heal. Low 4' to 5'2" 18.5"-23"
Same fit as the medium seat, but more narrow in the front to allow sitting with the knees closer together (i.e., reduced hip abduction). For people with stiff hips or hip abnormalities. Some men report that the Narrow Saddle offers more room for their "privates." Features a longer, flatter front pommel with a wider seat in the rear. Longer front-to-back and wider in the rear than the Standard Saddle, however hip abduction (leg spread) is the same in both. 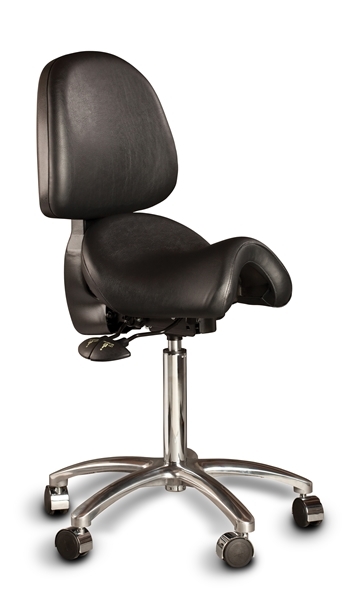 The introduction of the large seat was the result of feedback from male customers. While predominately used by men, it is also preferred by larger framed women and those with muscular or thicker thighs and buttocks. Hager's professional upholstery fabrics for the Bambach Saddle Seat are engineered especially for medical and dental applications. All fabrics are commercial quality and certified to meet California's stringent flammability requirements. Not all fabrics are available on all models. For color availability, please check the Purchase tab in the product description. Colors and textures on your computer monitor may vary from the actual material, and dye lots may vary. We encourage you to request a free swatch to confirm your color selection. Samples can be sent to USA destinations only. Durable commercial-quality 100% vinyl upholstery. Cleans easily with soap and water. Disinfectible with bleach. Scratch resistant. Upholstered stools and accessories are made to order. Allow 3-6 weeks for delivery. Full refund of the purchase price for Bambach Saddle Seats returned within 30 days in as-new, saleable condition with original, unopened packaging. Partial refund for Bambach Saddle Seats once assembled or used. Try a Bambach as long as you like. Return it in good condition and we'll refund the purchase price less a $35/month rental fee or a 20% restocking charge, whichever is greater. No returns on Slipcovers (seat covers) once used. We do not refund shipping charges. If your order shipped for free, actual shipping charges will be deducted from your refund.